Today I'm back with a New SPB Shell skin, This time its Galaxy S style theme for SPB Shell. 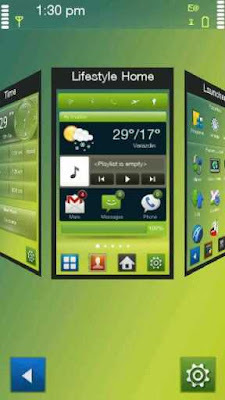 If you like Samsung Galaxy S then here is your chance to change your sluggish Symbian Home screen to an Amazing Android look. 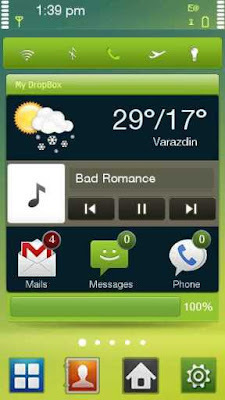 Before you download this theme, First you'll need to Install SPB mobile Shell software in your Symbian device. You can download SPB Shell for free from then below links. Read the following steps and work accordingly, make sure that you've Installed SPB Shell before following these steps. Step 3: Now Copy the Msettings.set file and Paste it anywhere in your device. Step 5: After following the above steps, Restart your Device. Step 7: In SPB Menu, Go to Settings and then Tap on Bottom-Right button. Step 8: Now Tap on Restore Settings Option and Browse to the location of Msettings.set file and Tap on Select. Step 9: Now Let SPB Shell do an Automatic Restart and Load new settings. Step 10: Once SPB Shell Loads the new settings, You'll start to see Galaxy S Menu on your device. Note: To make it more Original you can use the given Wallpapers. You can also Install the given GalaxySone.sis theme for making icons and look like original. Hope you Like this Theme, Click Here for More SPB Shell Skins. Leave a comment below. Please Share It if you liked it.